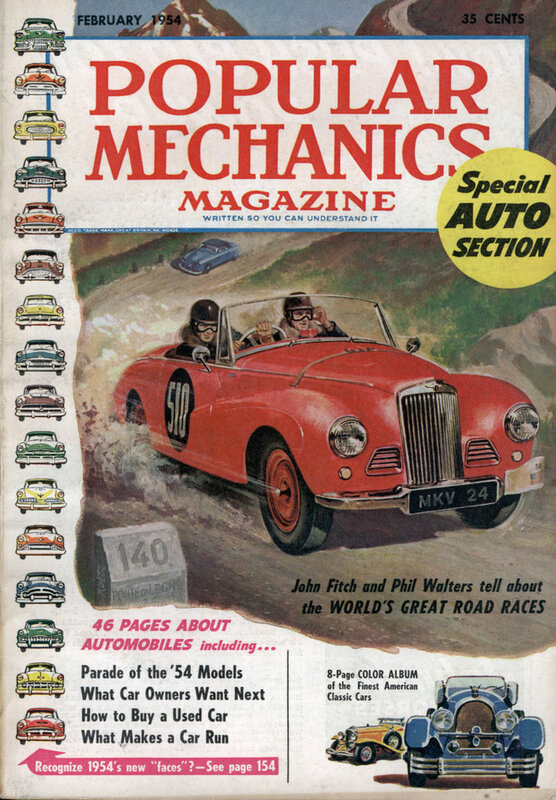 IN THE EIGHT PAGES which follow, Popular Mechanics salutes the Classics among the Classicsâ€”12 American automobiles chosen as the finest produced in that golden era defined as the period from 1925 to 1942. 3. Lincoln 1932-KB Phaeton Dual Cowl. 4. Packard 1929 Sport Phaeton. 5. Pierce Arrow 1933 Silver Arrow V12. 6. Stutz 1932 Super Bearcat. 7. Cord 1937 Convertible Coupe. 9. Kissel 1927 White Eagle Speedster. 10. Auburn 1936 Supercharged Speedster. 11. Marmon 1931 V16 Club Sedan. 12. Lincoln 1941 Continental Convertible. The years 1925 to 1942, in the minds of Classic Car fans, delineate the era in which the motor car had attained mechanical excellence, having thrown off all the heritage of the horse-drawn buggy, and had not yet passed into the hands of the stylist. These 12 cars, honored here as pre-eminent among their kind, are no museum pieces. Proud owners still operate and maintain them, some in their original paint, certainly most in their original hue, and as much as possible in their pristine operating conditionâ€”without the multiplicity of gadgets and chrome and automatic mechanisms of present-day cars. What is a Classic Car? It may have a thousand definitions in the minds of the Classic cultists. Surely it is not merely a “middle aged” carâ€”something between an antique and a modern! Simply expressed, it is an automobile of enduring beauty to which is harnessed a surplus of power. In the chosen years there are many great cars which might qualify. To choose the Classics among the Classics, the Editors turned to The Classic Car Club of America, whose 700 members devote themselves to preserving and cherishing the hundred and more models they dignify by the name. Officers of the Club accepted our bid for cooperation with enthusiasm. 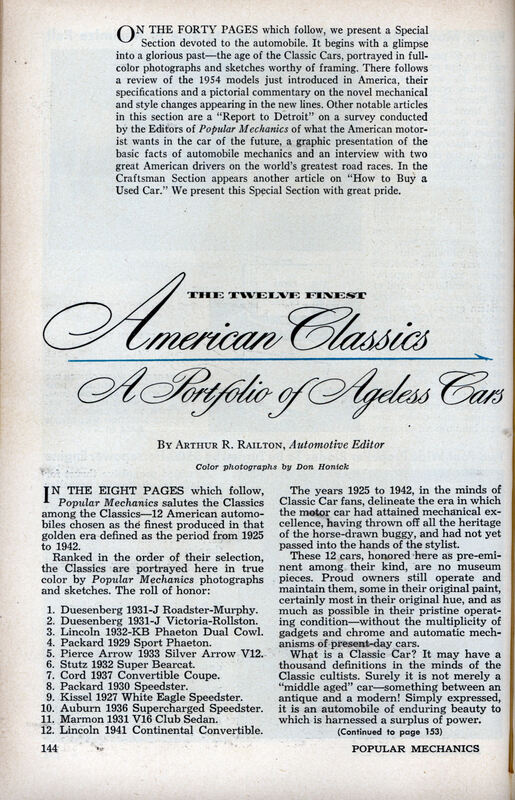 As a preliminary, the Board of Directors of the Club, whose national headquarters are at 122 Cedar Street, New York City, narrowed the field of Classics from scores to 27 American-made cars built in the Classic period. While Classic owners include some famous European makes in their rosterâ€”notably the Rolls-Royce, the Bugatti Royale, the Bent-ley, the Mercedes-Benz and Isotta Fras-chiniâ€”it was determined that only the American-made Classics would be considered in this special honor roll. The names of the 27 nominees for fame were submitted by Popular Mechanics to the entire membership of The Classic Car Club, whose votes determined the first 12 Classics as shown here. Moreover, their answers to our questions and their wealth of comments attested to their enthusiasm â€”and to their variety of opinions on what constitutes a Classic. And how, from those 18 model years, do they select the Classic from the less distinguished? The test or definition is almost as varied as the number of members. But, while mechanical qualities are generally mentioned in the comments, it is obvious that body design is the primary concern of the classicists. The ideal, of course, combines both appearance and performance in the highest degreeâ€”as embodied, for example, in the magnificent Duesenbergs that won both first and second honors on the list. “It must look like an automobile.” Unquestionably the winners do. They have graduated from the surrey and sulky stage. They have not yet adopted the lines of the airplane and yacht. Hood, wheels, headlights, doors, taillights are well defined entities. “A long hood is essential.” The select 12 all qualify. From the lean, tense-looking Duesenbergs to the relaxed, luxurious Continental, all have long hoods that cover big engines. “It is big, racy and expensive.” By the dollar standard of their day (or, for that matter, of ours), the leading Classics all meet the test of “big . . . expensive.” Finish and materials have improved the luxury of modern automobiles, but the Classic fans will argue that no 1954 automobile can match the 1937 Cord or the 1930 Packard Speedster, for example, in raciness and costly style. “Tends toward massive styleâ€”a luxury car.” There is plenty of evidence to support this definition among the 12 winners. The two phaetons, the Lincoln Dual Cowl 1932 and the Packard 1929, are huge. In both of these, the rear seat is a comfortable vast-ness. You can straighten your legs out and still not touch the front seat. And yet the passenger area occupies only about half the car’s over-all length. These cars are truly massive. The Marmon 1931 with its 145-inch wheelbase is another that more than meets this qualification. “Should have a surplus of power.” Generally, the Classics are powerful even by today’s standards. The most classic of all, the Duesenbergs, have a straight-8 overhead-valve engine that develops 265 horsepower. The Marmon V16 (yes, that is 16 cylinders) produces 200 horsepower and the Auburn Supercharged Speedster of 1936 develops 150 horsepower. “A Classic is a man’s car.” The Kissel White Eagle Speedster, built in 1927, is exactly that, without ornamentation, power conveniences and other “complex simplifications.” The man who owned and drove a Kissel was a man through and through, say the followers of the Classics. And the same is true of the Stutz Super Bearcat of 1932. Nobody is suggesting that Detroit should abandon its present designs and go back to the Classic standards. In the first place, the price would be prohibitive. The Duesenbergs cost about $8500 back in 1931 and that was without the body! When you bought one, you bought the chassis (engine, frame, running gear) and hired someone to put a body on it. That is the reason for hyphenated names like Roadster-Murphy, Victoria-Rollstonâ€”Murphy and Rollston being noted body builders of the time. In a sense, however, Detroit does make use of classic designs because such designs are part of the history, the experience, of automobile design and no engineer or stylist can ignore history. The Classic was ahead of its timeâ€”it led the way. Look again at the 1933 Pierce Silver Arrow V12. Built 21 years ago, it still looks modern, even to the recessed door handles that are yet to come out of Detroit.